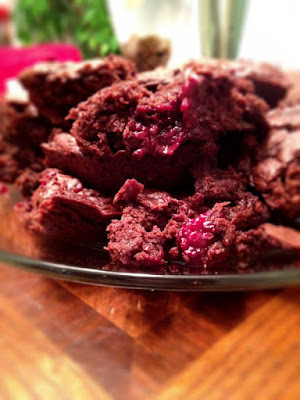 These brownies are ridiculously fudgy. They have to be since I put "fudgy" in the name.They have triple chocolate power--in the form of melted chocolate, cocoa and chocolate chips. And they have double berry power--in the form of triple berry spreadable fruit and plump, fresh blackberries, adding a tangy contrast to each sweet bite. The berry-chocolate combo is not the most popular one, but it should be! Melt the 2/3 cup of chocolate chips. To melt use a double broiler or create your own: Heat a small pan of water over high heat until boiling. Place another small pan on top of that and place the chips in that one. Use a rubber spatula to stir until melted. Remove from heat and let cool while you prepare everything else. In a large mixing bowl, combine the jam, soy milk, sugar, canola oil, and extracts. Mix until no lumps or large clumps of the jam are visible. This took me about 2 minutes. Stir in the flour, cocoa powder, baking powder, baking soda and salt. Stir until well mixed; I use a fork here because the batter is thick and can clump up in a whisk or mixer. Mix in the melted chocolate as well. Fold in the remaining 1/2 cup of chocolate chips and the fresh blackberries. Spread the batter in the baking pan. Bake for 45 minutes. No toothpick. Just trust me it's done. Remove from the over and let cool. If you want to serve it immediately it's best to wait 30 minutes before you cut.